Fourth Row Center: Film Writings by Jason Bailey: In Theaters: "The Black Power Mixtape 1967-1975"
What he found is, for students of contemporary American history, astonishing. There is footage of young Stokely Carmichael, charismatic, composed, and complicated; he’s as fierce giving an address in Stockholm as he is soft interviewing his mother in their Chicago living room. Young black mourners outside of RFK’s New York funeral despair of any real progress in the wake of yet another assassination. William Kunstler is interviewed in the aftermath of the debacle at Attica. There are remarkable, off-the-cuff shots of Harlem circa ’73, transposed with the shocking commentary of a white guide on a passing tour bus. The Swedish cameras ride along with both cops and drug dealers (“Everyone is selling dope,” says one of the latter, “from the government on down”), providing a vivid portrait of the devastation of the heroin epidemic, given a face and voice by the devastating interview with a teen prostitute. But the most intriguing footage captures, just in flashes and snatches, the fast rise and equally quick fall of the Black Power movement. 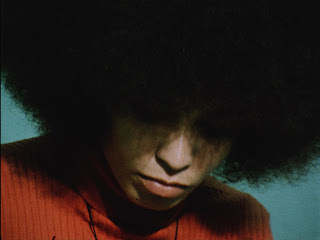 From Carmichael we go to the first roar of the Black Panthers; there are extraordinary shots of Eldridge Cleaver in exile in Algiers, of Huey Newton being bailed out, of Lewis Farrakhan just before he came to power, of the Angela Davis trial. Davis herself is heard from twice—then, in a riveting jailhouse interview, and now, in a reflective voice-only interview. These audio appearances, which sometimes have the feel of a DVD audio commentary, feature not only period figures like Davis, Melvin Van Peebles, and Harry Belafonte, but contemporary musicians and writers like Erykah Badu, Talib Kewli, Sonia Sanchez, and Robin Kelley. They provide not only current reflections and recollections, but valuable context—particularly in understanding how drugs put the brakes on the whole bag. Also among the commentators is Ahmir “Questlove” Thompson of The Roots, who also wrote the original music for the film; it is so authentic to the period that I was shocked, in the end credits, by how few vintage songs were used. There is the occasional sense that the film may have been padded a bit to get to feature length; a lengthy sidebar taking on a TV Guide attack piece claiming Swedish television to be “un-American” is, at best, only tangentially related. And the filmmakers don’t really seem sure of how to bring the picture to a close—Erykah Badu’s comment that “It’s not about black and white, it’s about telling our story,” is a valid one, but also highlights the unfortunate fact that this is a story being told by outsiders, and one that occasionally lacks in insider’s insight. Those complaints aside, The Black Power Mixtape 1967-1975 is a good and valuable film, providing a potent snapshot of that memorable intersection of Black music, culture, and politics. "The Black Power Mixtape 1967-1975" opens tomorrow in limited release.